When visiting the northern province of Lang Son, Bac Son district’s Quynh Son commune is often the first stop for tourists who wish to experience local life through homestays. Located some 170km northeast of Hanoi, Lang Son played a role in the historic Bac Son Uprising against the French in 1940. The area has not only beautiful natural landscapes but also traditional cultural values highlighted by tours to the village. 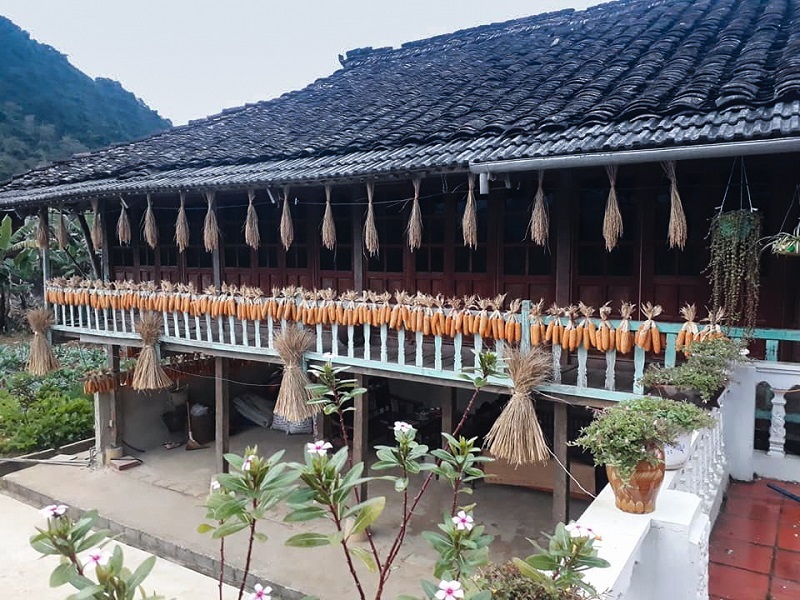 Chu Thi Thu Phuong, Director of Quynh Son commune’s Homestay Management Board, said the commune has 460 families with 1,800 people residing in six villages, 90 percent of whom are part of the Tay ethnic group. After a 2010 survey, concerned agencies decided to set up the first five homestay services in five family homes. There are now eight families offering the service and 20 other households are preparing to register. Duong Cong Chai, who was among the first five families hosting guests, said he now has eight rooms for guests to stay overnight. “Each year, I receive nearly 800 guests, 15-20 per cent of whom are foreigners,” he said. In the first eight months of this year, Chai received 60 groups of visitors with 500 people staying overnight. From a nearby mountain peak, one can see the whole Bac Son valley with its colourful rice fields – green at the beginning of rice planting season and yellow in harvest season. Bac Son town appears in the skyline with various modern buildings, which are in stark contrast with the houses on stilts in Tay villages. Tay people in the northern mountainous region, especially the ones in Quynh Son commune, have long lived in houses on stilts. On the first floor, they store agricultural products and raise cattle and poultry. The living room, bedroom and kitchen are on the upper floor. Some of them build houses to keep animals separate from the main living area. In wealthy families, walls of the main house are made of lim (iron wood), while families with less income may use cheaper wood or bamboo. Most of the houses on stilts in the area are roofed with yin-yang tiles, a kind of construction material produced by the Tay group in the commune. “Yin-yang tile lasts for long time,” said Duong Cong Chich, a local. Houses roofed with yin-yang tiles are cool in the summer and warm in the winter, he said. The tile is made by a careful process from clay from the rice fields, which is sliced into small pieces. The clay pieces are then sprayed with water for 20 days to make them more soft and elastic. Workers put the clay into moulds to make curved tiles, which are left to dry in the sun for one to two months before being put in oven to bake for ten days. The completed tile is extremely hard but is not easily broken. There are 30 families in Quynh Son commune producing the material for customers in the province and other neigbouring areas. Tourists coming to the commune can taste local delicacies like fish steamed with lemongrass, boiled chicken and black sticky rice cake. The black glutinous cake is made of sticky rice planted on the mountain, beans and ash. After washing and soaking rice and beans in water, fire ash is added along with salt and pork, then the whole package is wrapped in dong leaves. The cake is boiled, and then sliced into small pieces containing various colours: the white of fatty pork, the yellow of the beans and the dark brown of rice mixed with ash. At night, tourists are entertained with folk music performances by locals. Phuong said around 40 locals are divided into two teams to serve guests. Interested visitors can join the performance as well.